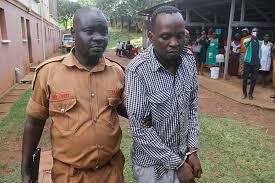 A prison warder leads Kaddu to the prison bus after his past appearance in court. Mwanga II Grade One Magistrate Julius Mwesigye has further remanded to Luzira prison Herbert kaddu because prison authorities presented him in court late after his case had been adjourned. 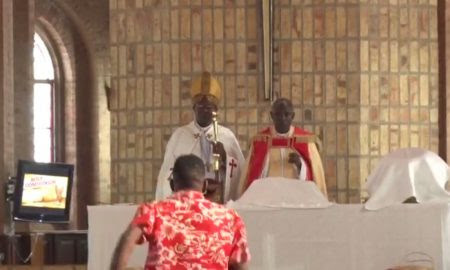 Kaddu faces charges of threatening violence and disrupting a peaceful religious gathering after he, on April 1, charged at Namirembe Diocese Bishop Wilberforce Kityo Luwalira during Easter service on April 1. Mr Mwesigye set May 14 to hear the case again. Kaddu, 34, a tour and travel driver from Mackay Zone in Mengo Lubaga division, on the said day armed with a stick and dressed in a backcloth drove to Namirembe Cathedral, jumped out of the Super Custom van he was driving and made for the Altar where Bishop Luwalira and Rev. Canon Benon Kityo, the dean of Namirembe Diocese were leading service. A video grab of Kaddu charging for the clerics. The two clerics were only saved by a bar at the Altar which tripped Kaddu and he fell before worshippers swang into action. Kaddu was charged and has since denied the three counts following a police medical report that confirmed him as sane, contrary to his family’s assertions that he was mentally unsound .